Land grabbing in Cambodia has proven to be a lasting epidemic. Cambodia’s status as a developing nation means land acts as a valuable commodity attractive to the eyes of foreign investors. As a report by Aprodev explains, land grabbing usually takes place in food insecure developing countries where the original users of the land are poor families and farmers who live off the land. This land is invaded by either the state itself claiming to own it, or by foreign companies, and is then often sold off and used to produce products such as biofuel, ‘cash crops’ and rubber. However, Human Rights Watch has contended that these deals are usually facilitated by official corruption and unbridled foreign investment. Land grabbing is a major impediment to the livelihood of the many Cambodian citizens thrown off their land with nowhere to go. 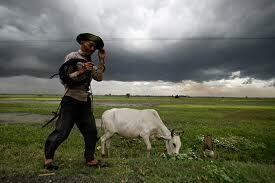 A large percentage of the country is made up of families dependant upon agriculture. Despite the 1993 Constitution of the Kingdom of Cambodia protecting rights to own land and the Land Law 2001 giving further effect to this, land grabbing has had an adverse impact on 700,000 people living in Cambodia. Only very few people own deeds to their property in Cambodia – a remnant of the Khmer Rouge regime, which banned privately owned land and destroyed most deeds. Although there is a government programme set up to begin creating title deeds for the poor, it has been criticized as slow and ineffective. This has made land grabbing a contentious issue as individuals have little legal basis upon which to defend their land. Many who have lodged their complaints have received little help. In addition the Human Rights Watch 2013 world report states that those who do protest against land grabbing have been imprisoned. In particular is the case of Yourm Bopha who is a leader of the long-term protests against illegal evictions of residents of the Boeung Kak area of Phonm Penh. On March 27 2013 the Cambodian Supreme Court denied bail to Bopha who was imprisoned in December 2012, after receiving a three-year sentence following politically motivated charges for protesting against land grabs. This was also seen in a previous case in May 2012, when thirteen women who had demonstrated against land grabbing were arrested and convicted of illegally occupying land and rebellion; all were sentenced up to 30 months in prison. As the BBC reports, although the Cambodian courts uphold sentences on protestors there have been no convictions of those accused of seizing land. A recent investigation into land grabbing operations in Cambodia and the surrounding regions suggested that some are being funded either directly or indirectly by Deutsche Bank and the IFC.